The government of Brazilian President Jair Bolsonaro plans to auction seven offshore oil fields in the northeast of the country, despite the recommendation against analysts from Brazil’s main environmental agency, according to documents to which the Associated Press had access. Ecologists say it is the latest example of how Bolsonaro, who campaigned with promises to revive Latin America’s largest economy by reducing bureaucratic obstacles, is ignoring warnings and scientific evidence in the name of progress. The news comes at a time when Brazil, one of the world’s largest oil producers and energy consumers, is advancing in the privatization of several industries, such as offshore exploration. The Brazilian environmental institute, known by its acronym IBAMA, monitors compliance with legislation and aims to promote the sustainable use of natural resources. Its analysts discouraged looking for crude in seven of the 42 oil fields that the regulatory agency Brazilian Petroleum Agency brought to auction in March. Three of the auction fields in October are in the Jacuipe basin and four in the Camamu-Almada region, both in the waters of the northeastern state of Bahia. The new head of the institute, Eduardo Bim, rejected this analysis, which warned that prospecting in “areas of high sensitivity” could cause spills. The study, dated March 18, also points out that the spills could destroy the ecosystem of the Abrolhos Islands, an area of ​​913 square kilometers (353 square miles). Four of the five Abrolhos Islands are in a marine national park with unusual coral formations, tropical fish, whales, seabirds, turtles and dolphins. The dispute within the IBAMA was initially collected by the newspaper O Estado de S. Paulo. AP was able to access the documents and verify their authenticity. The analysts of the official organism indicated that in the zones to auction they have never done prospections, what requires more “strategic studies that could evaluate the aptitude of the area”. These studies, according to the analysis, are necessary to give “more legal protection” to investors in case of an accident. Analysts also wrote that a spill could reach the coast and the archipelago in two days, and authorities would not be prepared to respond quickly or adequately to protect marine life. “This is compounded by the fact that the impact of a major spill in mangroves and corals is generally irreversible, damaging the economy and local health,” the document said. In response, Bim indicated in a letter to the Ministry of the Environment, dated April 1, that he does not see “the need for the exclusion of the (seven) fields as the technical information suggests.” He did not detail why he thought he could ignore the warnings. In a statement, IBAMA indicated that, together with the Ministries of Environment and Energy, it agreed that the auction was viable. The operation “does not imply either the automatic authorization to extract gas and oil or the anticipation of the result of the environmental licensing process”. The institute indicated that even then studies on possible spills would be requested. The statement also indicated that auctions have been made earlier in oil fields closer to the marine park of Abrolhos than those offered at the auction. Carlos Minc, Brazilian Minister of Environment between 2008 and 2010, said he had blocked attempts to search for oil near Abrolhos because the migration of whales and dolphins in the area would be affected by maritime traffic. “The humpback whales came out of the list of animals in danger of extinction because of this. How can Brazil take this step back? “Asked Minc. “We have to prevent them from destroying our marine biodiversity in the name of benefits.” Brazil is the ninth largest oil producer in the world and the third largest in the Americas, according to the US Energy Information Administration. 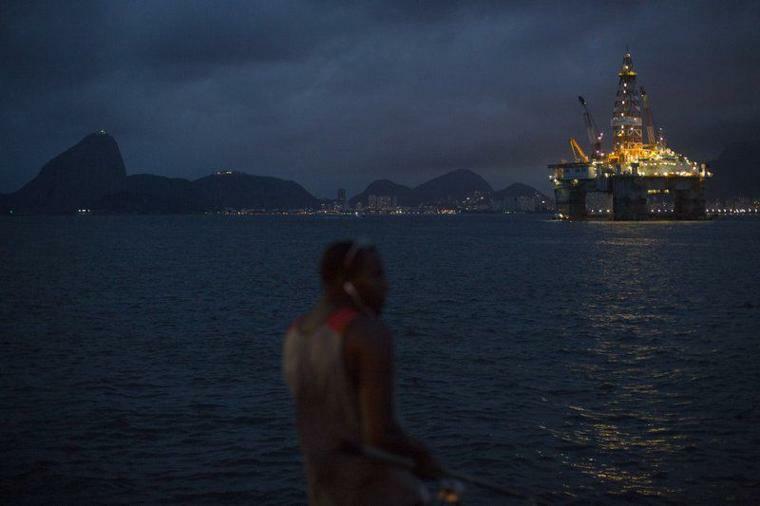 In this file image of April 21, 2015, a man fishes near an oil platform in the Guanabara Bay in Niteroi, Brazil. The country produced in 2016 3.24 million barrels per day of oil and other derivatives. Brazil is also the eighth largest energy consumer in the world. Bolsonaro has often said that environmental regulations should not block business. Before taking office on January 1, he promised to take Brazil out of the Paris Agreement against climate change. Then he has backed off, indicating that Brazil will remain in the agreement. AP reported this month that the Bolsonaro government intends to make drastic changes to a council that oversees the country’s environmental policy, replacing a broad committee with a small group of political officials. Bim and the environment minister, Ricardo Salles, are among the authors of the plan. According to the project, IBAMA would assume the powers of the federal agency that protects conservation areas such as national parks and biological reserves, such as the Abrolhos marine park that would be threatened by oil fields. Bim, Salles and the other authors of the project indicated in the text that the reform is necessary to streamline environmental governance and “avoid international interference” in Brazil. How Does A Tsunami Occur?